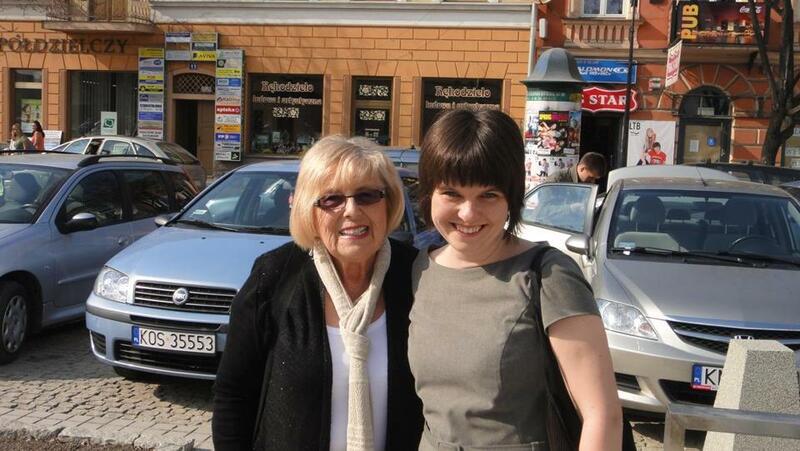 Janet Singer Applefield, with Karolina Panz in Poland. Janet Applefield has finally said goodbye to the mother she last saw 72 years ago. That was when Applefield was handed over to a stranger to save her life. It was the research of a Polish Catholic, Karolina Panz, that allowed Applefield to discover her mother’s fate. Panz, 31, “has restored a beating heart into the bodies that were our family. The names that were our family now have characters and depth and feelings and motives,” said Applefield’s son Jonathan as he introduced the scholar at an event sponsored by the Brookline educational group Facing History and Ourselves in December. Researcher Karolina Panz helped determined the fate of Applefield’s mother Maria Singer (shown holding child) and other family members. Janet and Jonathan Applefield held a memorial service at Plaszow in April, accompanied by Panz and two descendants of a Catholic family that sheltered Applefield on a farm during the final years of the war. Applefield brought letters written by her extended family to her mother. In spirit, at least, Maria Singer was introduced to the three grandchildren and five great-grandchildren she didn’t live to see. “We stood under a little bush in the shade and read all the letters,” Applefield said. “I cannot imagine how hard it was for you to give away what you love most,” great-grandson 15-year-old Isaac Milley of Sharon wrote. “I wish you were here today to see what a kind, amazing, and loving person you brought into this world,” added his 17-year-old brother, Jacob. Originally named Gustawa, Applefield was born in 1935 into a prosperous Jewish family in the southern Polish town of Nowy Targ. 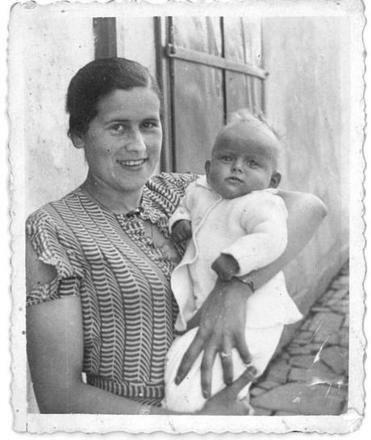 In 1941, after the Jews were forced into a ghetto and rumors swirled of deportations, Applefield’s parents placed her temporarily with a Catholic woman. With wavy blond hair, Applefield looked like a typical Polish girl; she eventually assumed the name of one after her father obtained a falsified birth certificate. Before finding a haven with the farm family, she would stare down a suspicious Gestapo officer, endure beatings from an older cousin entrusted to care for her, and spend a harrowing afternoon abandoned in Krakow. After the war, her father, Lolek, emaciated from labor camps, found her in an orphanage for Jewish children. Aside from two brothers who had left before the war, they were the only surviving Singers. After receiving death threats when they tried to resume their lives in Nowy Targ, father and daughter immigrated to the United States in 1947. The father remarried, and his daughter took on a new first name, Janet. Although Applefield has been speaking out about the Holocaust for a quarter of a century, she found it too painful to dig into the more harrowing details of her family’s experiences. For decades, she left boxed up her father’s diary and correspondence from the Holocaust era. They would have remained untouched had it not been for Panz and Google. The story of how Panz — who grew up in a country virtually without Jews — came to care so much about their fate begins some 15 years ago. As a high school senior in Warsaw, Panz arranged for Israeli students to spend a day with her classmates. She had just taken part in a March of the Living event, accompanying a group of young Canadian Jews on a visit to Treblinka. At a candle-lighting ceremony at the former death camp, she cried. Her tears moved the Canadians. They hadn’t expected Poles to care about the Jews. Janet Applefield’s parents, Lolek and Maria Singer, were married in 1934 in Poland. Many of her extended family died in the Holocaust. 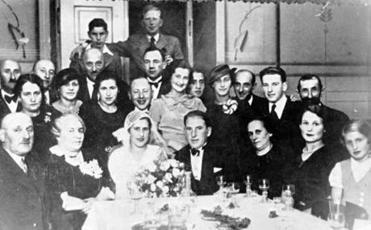 Through the visit of the Israelis, Panz hoped the Poles and Jews would see each other more as people and less as stereotypes. But one of her teachers, the wife of the school director, forced her to cancel the visit at the last minute. “Jews in our school? What are you thinking? How is it possible?” the teacher told Panz. After high school, Panz attended programs at the Auschwitz Center for Dialogue and Prayer. While in college, she initially wanted to research Polish memories of the Holocaust but became disenchanted by how members of the World War II generation whitewashed history. For example, she said, they lionized the Polish partisans who fought the Nazis and Soviets, ignoring that many of these same “heroes” also perpetrated postwar pogroms against the Jews. “I decided to reconstruct the story to see what really happened,” Panz said. For her master’s degree at the University of Warsaw, Panz wrote a thesis about Polish-Jewish relations before and during the Holocaust in a town outside Warsaw. After she married, her husband, a surgeon, was hired by a hospital in Nowy Targ. There, as she raised two sons, she set about tracking down the town’s Jewish past. With the intensity of a detective, she scoured archives for pre-war census data, property transactions, and tax records, as well as the Germans’ meticulous records of the deportation of Jews and the disposition of their holdings. Accompanied by her young children, she visited sites associated with the 2,000 Jews who had lived in Nowy Targ before the war; none live there now. The town history offered only two vague sentences about its Jews, Panz said. More prosperous families tended to leave longer paper trails, and that was what led Panz to focus on Emanuel Singer, who owned a store on the town square that sold hardware and farm supplies. He and his wife, Helena, raised six sons, three of whom went into the family business. Panz longed to fill in the picture of the Singers. In June 2012, through a Google search, she struck gold in the form of a website, janetapplefield.com , titled “Janet Singer Applefield: Teaching Young Adults Tolerance By Telling My Story.” Panz realized she had found Emanuel Singer’s first grandchild. Posted on the website is an array of family photos, from posed formal gatherings to snapshots of outings. Nearly all those pictured would have their lives cut short by the Holocaust. Panz e-mailed Applefield about the Singers. Emboldened by the young researcher’s passion, Applefield sent Panz the family papers. Tracking down the fate of the various Singers, Panz assembled a complicated story of bravery and brutality, greed and generosity, strokes of fortune and misfortune. From testimony at war crime trials in Germany during the 1970s, Panz learned how the Gestapo had chained Emanuel Singer to the back of a horse-drawn cart and dragged him to his death. They were trying to find out where he had hidden his money. Later, the Germans dug up two suitcases buried in the floor of his house. After the war, more money dropped from the ceiling when it was undergoing repairs. Based on her research, Panz believes that Applefield’s falsified birth certificate had been supplied by the lover of her cousin. A Catholic, the man was married and had five children. Although he claimed to have been a member of the resistance, he likely was a Nazi informant, Panz said. Panz plans to write her doctoral dissertation on the life and death of the Jewish community of Nowy Targ. She intends to cover the post-war era, when Poles killed scores of returning Jews. She was invited to Boston to present a paper at the annual meeting of the Association for Jewish Studies. Focusing on the Singer family, it examines the role of property in determining the fate and the memory of Jews during the Holocaust. “Property is the final witness to the past,” Panz said. Last April’s visit to Poland was Applefield’s fourth since the war, but the first at which she spoke in public in her hometown. She addressed students at the high school her father had attended and an overflow crowd at the town hall, which had been converted into a museum. Beforehand, Applefield asked whether she should talk about the anti-Semitism she encountered as a little girl. “Karolina said, ‘You have to be truthful. We Poles have to come to terms with our past,’ ” Applefield said. Applefield said when she showed pre-war pictures of her family, an older woman jumped up. “I remember your mother. I remember you,” the woman said. “Your mother was so beautiful, so elegant and you were such a cute little girl. I always wondered what happened to you.” She then walked up to Applefield and embraced her. It was only a year ago that Applefield learned what happened to her mother. Panz discovered a statement by a man who had known the Singers. He was part of a burial detail at Plaszow. Maria Singer was 33. Steven Maas can be reached at stevenmaas@comcast.net.